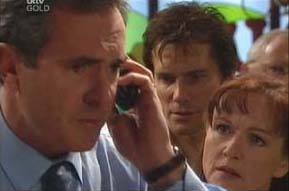 Libby is on the phone to Karl, explaining what has happened, regarding Drew and the accident on the farm. He tells her that he'll try and get there as soon as he can and reminds Libby that Drew is a fighter. She asks if Susan will be able to come, and Karl says he'll ask her. Everyone in the pub is silent trying to find out what is happening. Libby reassures him that she isn't alone and that Ron and Ben are with her. Karl and Susan have arrived. 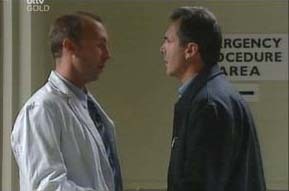 Libby spots the surgeon coming through the doors, so Karl rushes to talk to him. Ron introduces himself to Susan, who looks a little lost. Karl comes back after talking to the surgeon and lists of a whole load of medical terms (I have no idea what he was saying!) about Drew, saying that they're flying in a top surgeon and that he will be fine. Chloe asks Flick why all the extra people are standing about in reception, and doesn't take her excuse that the tour group arrived early. She also comments on Toadie's lateness, telling him that 'punctuality isn't an option' as he rushes in to start work. Chloe continues outside to do 'something important'. Darcy pops around to inform Flick and Toadie about what's happened on the farm. They're pretty shocked to hear that Drew is undergoing surgery. He tells them he'll keep them up to date. The surgeon comes out the surgeon and talks to Karl; Drew has died. Karl walks around the corner, where Steph and Stuart have arrived, and without saying anything it is obvious what has happened. Libby breaks down into tears. Ron and Susan also start to cry. A few days go past! Rosie is nervous about the funeral and apologises to Harold for being so agitated. She tries to reassure herself that she's done lots of funerals before, and of young people. Harold agrees that this time it's different, the family has already suffered to much. Lou apologises for being late; he wasn't sure what to pack. They head off. Flick and Toadie have finally managed to get rid of the tour group. Chloe agrees that they are hard work and 'lower the tone' of the place. She tells them that she knows their thoughts are in Queensland and that if they want a break, they only have to ask. Flick and Toadie admit that its all they can think about. Toadie says he didn't go because he can't stand funerals, but that Drew would understand. Libby looks out the window at the stars. Steph walks over. Libby tells Steph of how Drew loved the night sky and that he was showing her the stars when they got together. She admits that she can't believe they'll be burying him the next day. Steph tells her he'll always be ther for her. Susan politely interrupts to ask if she should put Ben to bed. Libby says it's unfair to loose both Drew and Susan. Steph reassures her that her mum is getting better, but Libby says it's not the same. She just wanted her mum to hold her, but she couldn't do it. Ron has just got of the phone to Rose and tells them that she won't be able to make it as the air traffic controllers in Bangkok have gone on strike, they agree to go ahead though. Steph goes to check on Susan and Ben, leaving Rosie to ask Libby about any last minute adjustments to the service. Lyn joins Flick, Toadie and Darcy at the pub. 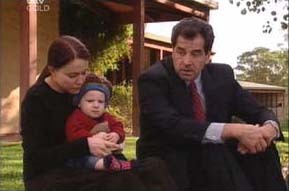 Darcy tells Lyn that they were unable to get a locum to cover, so he stayed. Flick apologises for crying. 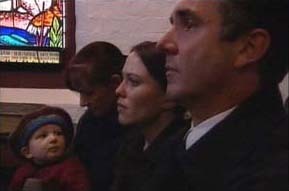 As Rosie takes the service, we watch the coffin enter the church, before joining the congregation inside the church. My dear friends, we've come here today, to say farewell, to a young man who held a very special place in many hearts, both here in his home town, and far to the south in Erinsborough. And while it's true his life has been cut tragically short, never the less he'd already attained what many people aspired to, he was an adored husband and father, a beloved son and brother, and a mate who always went that extra mile for his friends. Everybody liked Drew Kirk, everybody respected him, and I feel sure that he would've been content with that. Flick comforts Toadie as the funeral starts. She answers the phone to Marc, and tells him to ring Chloe's mobile instead. Toadie admits that he doesn't want to be there, and begins to cry. He was a man of utmost integrity; he was a rock to lean on in the time of crisis. To Susan and I, he was truly a son. We loved him as a son, we loved him especially because he was always there for Libby, even through the toughest of times, when a lesser man would've given up; Drew was there. ...the task of raising his beautiful baby boy. We will not fail him. Libby rises and places thistles on the coffin, she proceeds to sing 'Old Mountain Thyme'. As she finds it harder and harder to sing, Harold joins in to back her up, and she is able to finish the song. They carry the coffin out to the sound of bagpipes playing 'Over The Sea To Sky'. We see a shot of Lyn, Flick, Toadie and Darcy in Lou's Place, raising a toast to Drew. Back at the Church, everyone is outside watching in silence as they lay Drew to rest. Everyone is quietly reflecting the events of the day. Lou congratulates Rosie on the service. Rosie comments on how well they all did, and especially how brave Libby was. Stuart tells Libby that he thought of Drew as a brother, and tells her that she's welcome to ask him for anything, at any time. Flick arrives home and opens an anonymous present that was left on the doorstep. Lyn opens it to see a very expensive necklace. Flick recons it was Marc, and recons that he probably sent Steph the bike too, as he likes making grand gestures. Libby is standing outside holding Ben, crying. Ron walks over and they sit down on the steps. 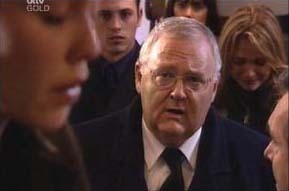 Ron apologises, saying he shouldn't have got Drew to leave Erinsborough. He says it's his fault. Libby tells him that it's no-ones fault, but Ron recons it is, and that he was 'stupid and selfish' and had to have it his way. Libby tells him of the morning. Drew was up at five am, waiting for the day to start, so excited. Libby explains how he kept trying to pull her out of bed, so happy with life, pursuing his dream with him and Dougal. Ron says it's all over, he can't continue with the farm. Libby tells him not to talk like that, or what's the point in anything?